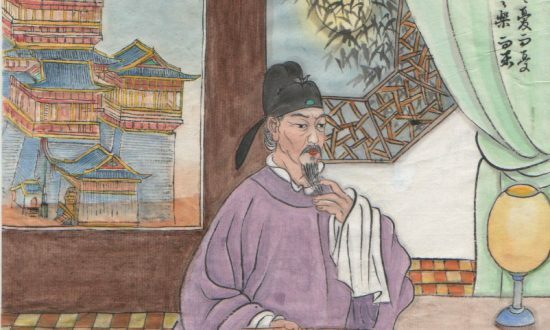 Fan Zhongyan is one of the most prominent figures in the Chinese history, as a founder of Neo-Confucianism and a great statesman, philosopher, writer, educator, military strategist, and philanthropist of the Song dynasty. After serving the central government for several decades, Fan rose to a seat of Chancellor over the entire Chinese empire when China possessed the world’s largest economy and population. Well represented by his well-known saying “Be the first to bear the world’s hardship, and the last to enjoy its comfort”, Fan’s philosophical, educational and political legacy is one that changed the course of the Chinese history, one so powerful that it continues to exert a profound impact on the Chinese civilization today. Fan Zhongyan, from Wu County of Suzhou, was born in Xu Prefecture (of Jiangsu Province) at a government residence. His father Fan Yong had been serving as an official of the government at different locations, and died in Xu Prefecture the subsequent year after Fan Zhongyan was born. Fan Zhongyan’s mother Lady Xie returned to Suzhou and buried her husband at Fàn Clan’s ancestral burial ground Tianping Mountain. Two years later, due to poverty and no financial means, Lady Xie remarried Zhu Wenhan, a government official at the Wu County. 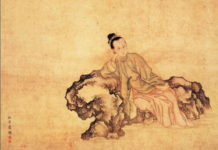 Fan Zhongyan’s name was subsequently changed to Zhu Yue. Fan Zhongyan moved with step-father Zhu and mother Lady Xie to different places where Zhu took governmental posts. Always feeling grateful to step-father Zhu’s kindness, Fan tried to pay back to Zhu’s family after becoming very successful. 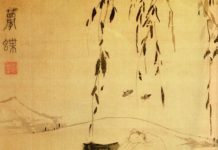 Fan Zhongyan studied in residence at Changbai Mountain Jiuquan Temple as a young boy. It’s said he lived in hardship with very little food everyday, but he never cared about it and instead persisted on learning. He read almost all the books available at the Changbai county. After learning his Fan family origin as a young adult by accident, Fan Zhongyan bid farewell to his mother Lady Xie. He traveled far away to today’s Shanxi province, befriended Taoist priests Zhou Debao, Qu Yingyuan, and other intellectuals such as Wang Zhu. The experience broadened Fan’s views about the world. In year 1011, Fan started schooling at the Yingtian Institute, the head of the Big Four Institutes. He lived an austere lifestyle but studied very hard days and nights. After several years, he had mastered different classics books, and established his aspiration of being generous and taking the world as his responsibilities. Fan served a variety of regional posts before taking the post in the 1030s as the prefect of Kaifeng. While there, he took on a young Ouyang Xiu as a disciple; a partnership that would become very important a decade later. In the early Northern Song era, prefectural schools were neglected by the state and were left to the devices of wealthy patrons who provided private finances. As Chancellor, Fan Zhongyan issued an edict that would have a combination of government funding and private financing to restore and rebuild all prefectural schools. Besides the remarks “Be the first to feel concern about the country and the last to enjoy oneself” in one of his most famous work of literature is Memorial to Yueyang Tower, “Better remonstrate and die, than keep silent and live” is another quotation from his poem Ling Wu Fu. 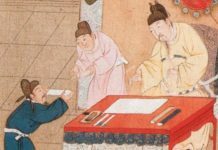 Fan Zhongyan had four sons and all of them served as officials in the imperial government of the Song Dynasty. Two of them Fan Chunren and Fan Chunli also became Chancellors of China.